DLT Trading, purveyor of high quality and hard-to-find knife brands, was already using (and loving) BigCommerce for their eCommerce platform when they came to EYStudios for their most recent redesign. The goals of the redesign were to create a more modern look overall for the site, as well as move it from the Blueprint to Stencil framework. During the redesign the EY worked to clean up and consolidate the existing code base. Those updates in addition to the new Stencil framework have made it easier for DLT’s own developers to go in and make additions and edits on their own. From a design standpoint, we created a Landing Page template as well as 3 Section Page templates for the team at use as needed to best merchandise their products. 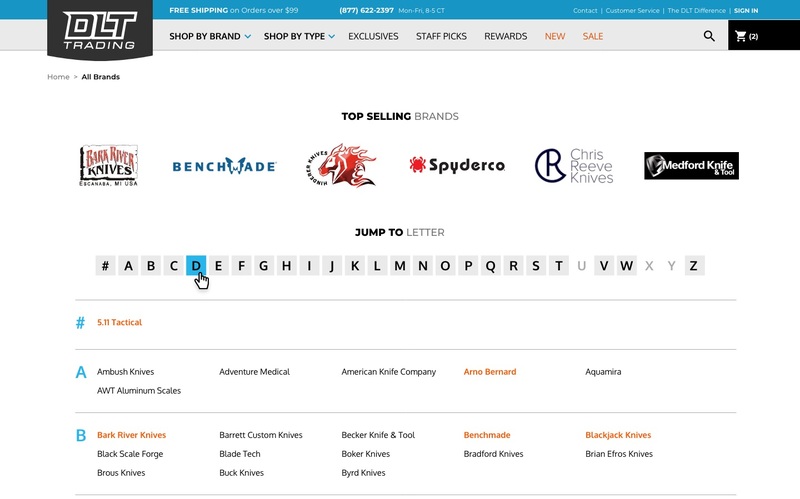 Additionally, we built a custom Brands Landing Page that highlights top selling brands across the top of the page but gives the user the ability to browse through all brands below that. Visit the Before & Afters section of our site to see the stunning changes and visit the new DLTtrading.com today! Next PostNext EYStudios Makes Clutch 1000 List!